"Located in a corn field in the middle of Iowa, Merlin Grady's repair shop has long been a watering hole for musicians of every wind instrument, but especially brass musicians. The shop is a feast for the eyes of a brass player, with instrument parts, cases, music, accessories and repair equipment all around. With the skill of a master craftsman and the patience of a corn farmer, Merlin Grady has been restoring and repairing the ""machines that make air into music"" for twenty years. Players from across the spectrum-beginners to major symphony orchestra players- cross the doorstep of his shop on a daily basis and Merlin approaches EVERY repair like a Rolex technician. In my opinion, Merlin is one of the top repairmen in the world. If you visit, take him a quarter pounder with cheese and a coke.....he likes that." "Merlin - how aptly was this guy named. I have known Merlin since the late 60's, the pre-barn days back when his repair shop was based in the chicken house across the road from his cousin's house. I know lots of fine repairmen but Merlin is the only one I let work on my horns. He is, and has been for years, simply the best. He has fixed horns of mine that have had students, literally, fall on them from the stage to the pit, a student's horn that was thrown against a brick wall, and various other less minor, but equally important, tragedies that happen to the horns of a professional trumpeter. I not only view Merlin as the best at his business, but as my friend. A visit to his repair shop is always a time of great conversation. I always leave with a greater sense of respect for Merlin, both as a person and as an amazing craftsman, in the true sense of what that word should mean." "Merlin Grady does the best slide and repair work I have ever seen. He is truly a magician with a trombone slide, which is a very rare gift. I have yet to see his equal, including those with national and international reputations. Merlin is a true perfectionist and I would not hesitate to send him any job, large or small. He's not only a horn doctor; he's a horn chiropractor, shrink, life coach and spa director, too!" "I have taken my band instruments from school to Grady Instrument Service for nearly 30 years. Merlin does terrific work, charges a very fair price, and has the instruments ready when I need them. In addition, he is the finest trombone technician in the area. I take my personal professional trombones only to him for repair and regular maintenance as do many professors at the University of Northern Iowa and the area symphony orchestras. His reputation as a top repair person is well deserved and I would recommend him highly." "Grady Instrument Service has maintained and repaired instruments for the Hudson band program for more than the 23 years I have taught there. I continue taking instruments to Merlin because I know instruments will get repaired in a timely manner, at a fair price and that the service work will be done properly. We are fortunate to have a repairman with a nationally recognized reputation for quality working in our area. I look forward to many more years of quality service from Grady Instrument Service." 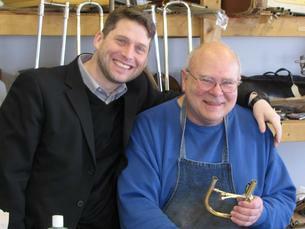 "The greatest instrument repair shop in the USA: Merlin Grady is the finest instrument repairman in this area. He is a small business with friendly honest service. I will only trust him with my school instruments and my own. It is very obvious that Merlin puts customer service and professional workmanship first on his priority list. I will be a return customer for years to come!!" "There's something magical that happens in the cornfields of Iowa -- MERLIN! When I first moved to Cedar Falls, I assumed I would have to travel great distances to have work done on my trumpets. Wrong! - I discovered one of the best right here in town. Merlin is a gentle, patient man who listens to what you need. And, the wonders he can perform with twisted forms that barely resemble musical instruments is .......well, truly MAGICAL!" "Merlin has always shown a relentless attention to detail when working on my trombone and I can always count on my slide coming back running more freely than when it was new."